Slavs are Sarmatians. Serbians knows as they are last bearers of Sarmatian name that was once universal name of all Slavs. Serbian imperial Nemanjic house was considered to be from the Dragon line. All symbols that were known as Sarmatian insignia were used by the Nemanjic`s. Let me remind you that we here speak of the ancestral noble house of the Polish St. Jadwiga. As for the symbols on old original Coat of Arms of the Nemanjic house... there was a Dragon that encircling and protecting the shield with ocila and white eagle (ocila are Serbian version of a Svbastika cross). Dragon itself represented connection of a land and sky. Its a bird and a snake in the same time. If we go one step deeper into the symbolism we coming to the Dragon as a symbol of ancestral white Goddess that was creator of all the life. You know that i here already mentioned Kosovo battle in 1389 (Serbs vs. Turks) and that creator of the Dragon Order- Voivode Milos Obilic killed Turkish Sultan Murad during the battle but, i actually never told you full story behind that battle, about Serbian military plan and strategy before and during the battle. Even that plan and tactics telling much of a Sarmatian tradition in a Serbian warfare. 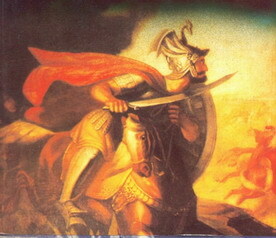 It is said that Sarmats had best cavalry of the antic times and, it is also known, that Serbians had best cavalry in the world in a middle age. But listen... before the Kosovo battle Serbian commanders agreed that cavarly needs to play major role in a battle that needs to happen. They choosed concentrated charge of winged cavalry, that famous Racowie concept (that later gave Polish winged Hussars and even famous USA cavalry during time of wild west) where riders ride in gallop in a tight knee to knee formation. It is common to think they are Iranian, they are not from Persia (Iran) they are just north of Persia, possibly the northernest parts of the Persian empire. Jatts also have Sarmatians blood. They traveled 2000 years ago east. To Pakistan/ India. Jatts are the least to indulge in other cultures from the Sarmatians except after Sikhism, but I know little that do not consider themselves Jatts still, if they truly are. why dont we ask crow about that. if i remember well he's expert on this topic. Batman is a Serb,too.He wears medieval house nemanjic insignia on his chest,legendary bat-dragon.Count Dracula too,he 's cousin of Batman through Romanian dragons we all know existed in mountains of Transylvania.True story...Which leads us to Superman,he's got high contrentracion of Haplogroup J2 due to intense consumation of special serbian goat milk which made them superior to other nations. First terrorist ever was a Serb,he killed Franz Ferdinand which started WW1. schlechter witz, bad joke mein lieber kroate. i really have no clue why your people are still full of complexes when it comes to the topic serbs. my advise is to put the ball down and remember whom you are talking to. your thankfulness towards germany should always be visible. btw, the anschluss of cro to eu is one of the biggest presents ger gave you. again moment for your thankfulness. my advise is, put your complexes aside and see what you can do with life. that in every spot serbs have more backbone than you is a fact. you treuly remind me of the other kroate here, el croate. he babbled the same bs like you. at the end, your just boring. me complexes? off topic? i have no clue dude what you are talking about, but rationalization is a good method to avoid the truth. as i said, frohe weihnachten kroate. Calm down dude...take your steroids...everything's gonna be just fine.And stop writing on your language,I don't understand it. About this topic...I personally think there is something racist about measuring Haplogroups and bragging with it on forum without even knowing which group you belong.Some people feel they're not appreciated so they search for glorious and divine ancestors. Most of central european people have similar DNA,and since we don't live on Madagascar we are all mixed up. it is also known, that Serbians had best cavalry in theworld i[b][/b]n a middle age. Yeah,we saw it on Kosovo battle...What about famous French,Spanish,English,Polish,Hungarian,Mongol,Ottoman,Knights Hospitallers,Egyptian etc etc?Never heard of it?Of course you did but you pretend they didn't exist. Some scientists in Croatia thinks we are Goths or Sarmatians,Alans etc...I think it's bs,we mixed with local Illyrian populace and now we formed central european nation not different than others.Same with Czechs Serbs and Polish. And stop writing on your language,I don't understand it. Sascha you are possibly the son of a serbian worker in Germany and now you call yourself German. Maybe you become Sarmatian when you eat Sarma? The one with lemons in the link. Now you are Sarmatian too!Congrats! I had it last Saturday on friend's wedding.Is Turkish recipe different than Croatian? Wow so much spices...nice touch with olive oil.My wife says she like recipe(she hates meat) and she will try to make me Yaprak sarma. When I want a menu, I'll go to the food threads. Back to topic, please. In times of Herodot to the east from Don Sarmatians lived. According to a legend transferred by Herodot, they have descended from the Amazon who have married Scythian young men. This legend reflects high position of women at Sarmatian society. Despite of obvious relationship of given peoples, Sarmatians always found out hostility in relation to Scythians, and they posses a main role in route of the last. Story in connection of the old coin, giving us insight into the one of many chapters of the old war. War that never ended. War between European native civilization and Euro-North African hybrid civilization. War between ancient Slavs (read it correctly- Sarmatians) and Egyptians/Romans. War between money flow on the line Cairo-Rome-London and money flow on the line Baltic-Balkan-Black See. So stop, stand by for the moment, you who know your Sarmatian origin, with a minute of silence. Give tribute to the ancient Sarmats, to those ancient native Europeans about whom Polish legends speaks. Their blood marks every corner of their vast civilization. Vast and glorious back then, as it is now and as it will be even more. I doubt they were light-skinned. Their last surviving descendants are the Alans/Ossetians. Try to think this way.... What would you say for Europeans in general? are they light-skinned? or What would you say for the today`s Slavs in general? are they light-skinned? See? Answers on those questions are positive but, things aren`t simple. From one side of Europe to another you have sub-racial variations, from lighter to darker skin. Those variations are natural, due to climatic differences and geographical distance. Even if we accept that non-Europeans influenced those differences, we understand that clime and geography represent main reasons for the differences. Simple, man in Portugal must be darker then man from Sweden. That is about Europe. Europe is one continent. One. One, but so many differences. Now, try to apply all that what i said above on Slavs. While Europe represent one continent, Slavs are kind of people living on the inter-continental level. So, even more differences are natural. As for Sarmatians, we know that old authors spoke of them as of people that lived on intercontinental level. Their ancient territories perfectly overlap with those of today`s and of old Slavs. Some old authors directly spoke of old Slavs as of Sarmatians. Old authors also wrote that Dacians and Thracians (and many other old people) actually were Sarmatians and that Scythians represented nomadic branch of Sarmatians. It is even said that Celts were comprehend as Scythians (meaning- Sarmatians). Buda (founder of the Budism) is considered to be White and Scythian in his origin. Old Indian manuscripts speak of invasion of the Whites that came from the other side of Ind river, from the territories that, as we know, in ancient times were populated by Scythians (Sarmatians). So tell me, why would you insist that for example old Picts of Britain for whom we know that they were Sarmatians, actually were not ancient Slavs but some non-European speaking people such are today`s Ossetians. Not to mention geographical distance between Britain and Caucasus. And, not to mention that almost entire territory between Britain and Causacus in the early middle age still was populated by old Slavs. Actually, if one wants to be correct he should say that most of today`s Europeans (and many today`s non-Europeans) are descendants of Sarmatians, while Slavs are still Sarmatians. Britain contained a frontier of the Roman Empire. Their soldiers came from all over and in those days did not usually return home. well, well, well,... let us go back to Picts. They were native Sarmatians on British islands. On the other side, of course that that you could found non-native Sarmatians on the British islands, too. Take those 5.500 Sarmatian warriors (hired by Marcus Aurelius, in 175 AD) that were recruited from what are today`s Slavic countries. In fact, genetic experts founded similarities between genes of the Scots/Picts on one side and Slavs/Sarmatians on the other side. They were able to prove connection and to differ native Sarmatians on island from the Sarmatians that came from continent. Point is, when Marcus Aurelius decided to hire Sarmatian warriors, he didn`t need to travel to the Near East, Iran or Caucasus to found them. No, they were everywhere. Everywhere were you can found Slavs even today or where, as we know, Slavs lived in the middle age before they were Germanized, Hungarized, Hellenized, Italianized, Albanized, etc, etc, etc. Picts. They were native Sarmatians on British islands. We know nothing about the origin of the Picts. Erm, you do realise the Picts were around long before then? Speaking as someone whose roots are exactly in that region. i think that my previous reply answered to this comment, too. Not only that Sarmatians were not Iranian tribe but we here speak of entire people of White humans (in all their variations) spread from the western-most parts of Europe to the Ind River, from Britain to the Siberia. And we have plenty of genetic evidences of it. Interesting but, things didn`t change much on this Earth, in last, let`s say 4.000 years. They were a confederation of indiginous tribes, so yes. Sarmatians were nomads who rode horses. At the same time, Slavs were people who lived in villages and farmed the land. They lived in the same geographical region, but had huge differences in lifestyle. Slavs' diet consisted of what they grew and raised while Sarmatians survived on horse meat and what they raided from Slavic villages. Sarmatians were also Indo-Iranic people (like their Ossetian descendants) and Slavs split from them long ago with the Balts. Slavs are more Baltic than Sarmatian, sharing the light skin and blond hair that originates around the eastern Baltic Sea. Yes i believe that serious connections between slavs and sarmations existed. Sarmations dwelled along the eastern banks of the vistula and western ukraine. Thus I believe that slavs and sarmation-scythians came into contact. I believe this esspescialy in the case of poland, in particular the south east. While I was reading herodutos histories, i noticed that some of the people he was describing and labeling as scythians could be protoslavic. As he went north and est, he described forest lands where people hunt and fish. He was very vague and I cannot assume it is accurate, but he made refrences like this that dI'd not match up with the traditional nomad scythian. Slavic peoples, even if contacted by greeks or romans would most likely be classify ed as scythians because they came from the north east and may have shared cultural similarities with the people's of the steppes. In tacitus germania, tacitus describes the veneti, whom some believe to be proto slavs. He states that he is not sure whether to call them germania or sarmations, because their way of life is similar to both. Thus, any slavs at the time we're most likely seen as scythians. Poland is very connected with sarmations. Many of the polish coat of arms are influenced by ancient sarmation cult symbols. Some sources even call poland the kingdom of the sarmations. Genetic testing has proven that the paternal gene r1a1 is shared amongst all slavs, but it was also shared amongst scythians people. I cannot help wondering if slavs and scythians were branches of the same people. Scythians took on an indo irnanian launguage while slavs spoke an indo european one. That's genetically proven Sarmathians were rather a R1a and J2 came to Iran and mainly Kazakh later. Sarmatians didn't have J2 haplogroup blood. is a race hate site - not a reliable source for anything. Its presence in that post puts the other 'sources' in question too. And by the way, any theories about 'Sarmatians' is just guesswork fed by a lot of romanticism - in fact we know very little about who they were. Their genes today aren't relevant either. This discussion is about genetical origin of Sarmatians, then what do you wanna speak about? DNA match of R1a (for Slavic as well as Sarmatians) and blond hair color, blue eyes color, ect... are a facts, not any race hate site.